We are lucky to have Robyn Galbos from Demand Studios with us today to answer some questions we've received about becoming a writer for them. She has provided some tips for applying and writing articles and information about some of the new Demand Studios programs, so let's get started! WOW: Hi, Robyn. Thank you for taking time out to talk with The Muffin about writing for Demand Studios. What kind of writers are Demand Studios looking for? Specific genres? Certain experience or college degrees? Robyn: Demand Studios is looking for all kinds of writers with a variety of backgrounds and interests. We are primarily looking for people with solid researching and reporting skills, and ideal candidates have had their work published in print or online. 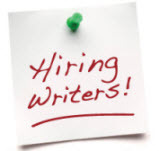 During the application process, writers must upload a résumé and a writing sample; the stronger the writing sample, the more likely the writer will be accepted. WOW: So, writers can use their knowledge they gain from hobbies and other careers to write articles and make extra money on Demand Studios. What are two or three tips you can give writers who are applying for positions? Robyn: First, take the application process as seriously as you would for a full-time position. Because this is an independent contractor position, sometimes writers think that they don't need to try as hard. Upload a recent résumé that highlights your writing experience and any expertise you may have. Proofread your résumé for typos. Typos in a résumé are a red flag when you're applying for a writing position. Second, put your best foot forward with your writing sample. Take time to research the sites for which you are applying to write, and take note of the voice and tone of the writing. Attach writing samples that would fit well on those sites. If you don't have published work, try writing an article in the style of eHow, LIVESTRONG, Garden Guides or any other site you're interested in. Be sure to submit original work as your writing sample, however, and remember to proofread your submission for typos as well. WOW: Thanks for the tips, Robyn. Many writers can write 400- to 500-word articles quickly; and therefore, they write several Demand Studios articles a day in a short amount of time. What are some tips for writing Demand Studios articles in a timely manner? Robyn: The simplest answer is "write what you know." The more you venture into topics that are not your area of expertise, the more time you will take to research and write the articles. If you know a topic, you likely know where to find the most credible references. A word of caution: Even though you know a topic, resist the urge to write off the top of your head without researching. We require references for every article, and facts must be verifiable by the copy editors. I also recommend that writers master one format before moving on to others. Once you understand the guidelines and nuances for a particular format, you get in a rhythm and can work a lot faster. Finally, really take the time to familiarize yourself with all of the Demand Studios guidelines. This will help save time on rewrite requests. WOW: More great tips. It seems like if writers take time at the beginning to learn about the templates and different types of articles, they will work quicker and more accurately in a few months. Demand Studios allows writers to suggest articles they would like to write. Please explain to us how this process works. Are these articles paid the same rates as articles that Demand Studios assigns? Robyn: Writers may create their own assignments in Demand Studios, and approved articles are paid on a revenue-share basis. We are looking for titles that revolve around a topical theme while remaining evergreen. For example, articles around filing your tax returns are perfect in the early part of the year. WOW: Sometimes, Demand Studios editors have to send articles back to writers to fix. What are some of the most common reasons why writers get their work sent back to them? Robyn: Every article that is submitted through the Demand Studios publishing tools is edited and fact-checked by a copy editor, and we consider rewrites to be a natural part of the editorial process. Copy editors look at articles with the eye of a reader. If there are questions about clarity or facts, the editor may need to ask the writer some questions. The most common reasons for rewrites are unverifiable facts, guideline violations, unclear sentence structure, or vague statements. An editor may also send an article back if the article does not directly answer the question put forth in the title or is not specific enough to address the title accurately. Writers who study the guidelines, do research, and cite their sources likely will receive fewer rewrite requests. WOW: So, copy editors and writers work together to make the articles as clear and accurate as possible. That makes perfect sense! Many Demand Studios writers make an average of $15 an article, but there are ways to make between $20 and $80 an article. Please explain how writers can make more money per article and about your new specialty writers program. Robyn: Demand Studios has several levels of special assignments that we reserve for our best writers: that is, writers who consistently deliver high-quality articles written according to all applicable guidelines. These higher-paying opportunities are for Demand Media sites and for our partner sites and include premium assignments for our copy editors. We regularly review our creator base and look for these standout performers. WOW: It's nice to hear that hard work is rewarded, and there are chances to move up in the company while writing for Demand Studios. Demand Studios periodically has the program "Write for a Cause." What is this program and how does it work? When will you be offering it again? Robyn: Demand Studios partnered with First Book in December to donate new books to children across the country, and the program was such a hit that we revived it for two weeks in mid-March. For every eight Demand Studios articles published during the program, Demand Media donates one book to a child in need. Thanks to our writers and copy editors, we have been able to donate a total of 26,639 books to kids so far. I can't say for certain when we'll offer the program again, but I can say it's been a huge success, and I look forward to the next round. WOW: 26,639 books--that is awesome! I'm sure writers enjoy "Write for a Cause," and are also looking forward to the next round. In 2010, Demand Studios started awarding one $1,000 grant to one of your writers each month for creative projects. How does a writer apply for one of these grants, and do you have any information on what types of projects or applications are receiving the grants? Robyn: Demand Studios contributors who have been with us for more than three months can apply for a grant. Eligible projects include works of fiction, non-fiction, essay collections, plays, screenplays, short films/videos, and feature length films/videos. Applications and supporting materials are accepted electronically at grantprogram@demandmedia.com. We accept submissions from the 1st through 7th of every month. The first grant was awarded to Demand Studios writer Dan Antony for the completion of his project, "Beeg Mec," a book that tells the story of the rise of a restaurant and the fall of a government. We post all of the winners on our blog, so you can check out the winners there. WOW: Thank you, Robyn, for taking time out to explain Demand Studios to The Muffin readers and any interested writers! If Demand Studios sounds like something you would want to check out, just click here. I enjoyed reading the interview with Robyn Galbos, especially since I received an important announcement from eHow. I started writing for eHow last year and found it fun and exciting and it was interesting to receive the announcements, which I've attached below. I was going to write an article to apply as a writer for Demand Studios, but it appears if I keep writing for eHow after May 8, I'm automatically eligible. I was wondering if anyone else has had this same experience or received these announcements. This is a first for me, so I was just wondering. Demand Studios is now the exclusive writing platform for eHow.com. Today, we are announcing that Demand Studios is now the exclusive platform for writing new articles for eHow.com. Congratulations, you have automatically been accepted into Demand Studios. This change will not impact any of your existing articles or payments currently affiliated with the Writer Compensation Program (WCP). Demand Studios gives eHow.com’s writers a more robust publishing platform including copy editors, quality assurance and a number of great, new resources for the writer community. We are committed to providing a quality experience and are excited for you to get started. Demand Studios has a rigorous writer admission process to ensure quality. Writers, like you, were pre-approved, because of your excellent track record. Quality is paramount, and our criteria for accepting eHow.com writers into Demand Studios were based on writer activity level and moderation history. By the end of March 2010, you should have published five or more articles, of which at least 80 percent were accepted. Also, you must have been a member of the WCP. Having written 14 articles with a 93% acceptance rate, you should be proud of yourself for being pre-approved. We are migrating thousands of writers on eHow.com over the next few weeks. We appreciate your patience and will notify you via email when you can begin writing for Demand Studios. In the meantime, it’s business as usual, and you can continue to publish on eHow.com. Demand Studios now offers the benefits you are accustomed to on eHow.com, with added flexibility. You can suggest your own titles and write articles that pay monthly on a residual basis. In addition you can select assignments that pay upfront. The combination of these options gives you the opportunity to make more money. You choose what articles you write and how you get paid. Continue to write using eHow.com's publishing tools and watch for an email notification from us regarding your transition into Demand Studios. For additional questions, please visit the FAQ or email us at writers@ehow.com. We wanted to let you know that Demand Studios is now the exclusive platform for writing new articles for eHow.com. We look forward to you learning and sharing your knowledge on eHow.com. I wrote for eHow before I got hired by Demand Studios, and so I also got that same email. I'm not sure how it all works since I am already a Demand Studios writer, but I would just follow their directions and ask questions in the forums when needed. Demand Studios owns eHow and so it makes sense that they are doing it all under the same guidelines now. Glad the interview was helpful to you. Thanks Margo! I really enjoy WOW! and Premium Green with all the helpful information. It's a great way to stay connected and learn new things as the writing world changes! Thanks to all at WOW! for sharing!